Interesting stats. The graph depicting the rise and fall of those three pairings in conjunction to the movie was interesting. I would bet that first up kick in feb/march was from the trailers. I'm 99% sure I know which archive you're talking about and it has been having some issues with influx. That said, it's one of the best on the net content wise. 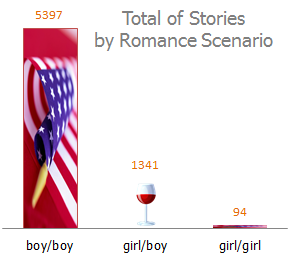 On another note, I've found that m/m trounces f/f in fanfic across many fanbases. Trailers, but also (I've now been told) that there were tie-in comics between Thor and Avengers movies that set up the Barton/Coulson thing, so now this makes some sense to me. Yes, you're right about m/m - I didn't even want to get into trying to explain that (and the female base of fanfic readers) in this post. :-) But it's kind of cool how often Pepper/Natasha are showing up as a background couple in stories I'm hitting now. So their numbers might increase. There's probably enough material to write a thesis regarding the predominance of m/m and the female fanbase (let alone a blog post). I didn't know that about the tie-in comics, though. I had wondered about why the Barton/Coulson pairing was so strong. I too have seen a lot of Pepper/Natasha as a side pairing, which is pretty cool. Having a larger breath of fictional female characters in tv and film would probably help. I think part of the reason why m/m is so prevalent is that so many of the strongest relationships with tension/antagonism/or that certain camaraderie (i.e. Sherlock) that make it so easy to ship center around two men. Off the top of my head, I can only think of one show with two main female leads like that--Rizzoli and Isles (hulu's The Morning After keeps referring to it as a romantic comedy instead of a drama as a bit of a joke). Though I have seen quite a few stories for The Devil Wears Prada pairing Miranda/Andy. I think there ARE a lot of PhD dissertations on the m/m popularity, and certainly the gender dynamics of tv/film that lead to fanfic. Early books on it included Camille Bacon-Smith, Henry Jenkins, Constance Penley, and even a famous Joanna Russ Trek article about K/S. I have seen a shift in the past few years towards more threesomes with women, because (I think) of stronger women characters that the authors didn't feel they could easily "get rid of" in the fic. White Collar is a good example there.